Whether you’re into mountain biking, BMX, touring or just enjoy commuting to work, a good set of pedals can make a world of difference in the quality of your ride. But finding a quality set of pedals that lasts can be difficult, especially if you bike often and for long distances. Type: There are three main types of pedals: clipless, dual-sided, and flat. Clipless pedals require specialized cleats, while flat pedals can be used with regular shoes. Dual-sided pedals give you the best of both worlds by offering a flat platform on one side and clipless on the other. Decide which type of pedal you want, so you can find a pair that suits your riding style and needs. Size: The size of the pedal is also important. 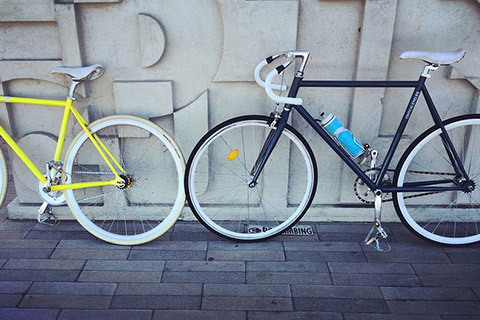 They need to fit your bike, and they need to be an appropriate size for your feet. As far as comfort goes, many pedals have varying float degrees to help you find the most comfortable position for your feet. Quality: Just like with any other product, you’ll find good and bad pedals. But if you’re like most riders, you really don’t want to risk your pedals bending or becoming damaged beyond repair after a few rides on rough terrain. Look for pedals made with quality materials, and check reviews to see what users have to say about their experiences. 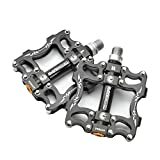 Shimano PD-R540 – The PD-R540 road pedals from Shimano are made of aluminum and chrome, and are compatible with SPD-SL cleats. Clipping in is quick and easy thanks to the large binding target, so you can get on and get moving. A pair of yellow 5deg float cleats are included, and these pedals come in two colors: black and white. The PD-R540 offers a cleat-dependent float and a wider pedal platform for added stability. The low-maintenance cartridge axle is sealed, so you save time and money. If you’re looking for a solid pair of clipless pedals that are highly durable, the PD-R540 from Shimano is a smart option. Commuter Road Bike Pedal – Riders who want versatility and flexibility will appreciate Wellgo’s Commuter Road Bike pedals. Dual-sided, these pedals feature one clipless Shimano SPD side and one platform side. The attractive aluminum black body hides scuffs and scrapes from heavy use, and the built-in reflectors increase visibility for safer riding. These pedals have a Cr-Mo spindle, and are compatible with Shimano 51 or 98A cleats. With dimensions of 93.5mm x 66mm x 28.5mm, these pedals will fit on most bikes, and the light weight of 320g per pair won’t weigh you down. The Commuter Road pedals give riders the option of choosing between clipless and regular platform pedals, so you can ride wearing whatever footwear you please. Shimano A530 – The A530 pedals from Shimano are also dual-sided, so you can decide whether you want to go clipless, or with flat pedals. SPD clipless on one side, and platform on the other. Shimano includes a pair of cleats, so you can start riding right out of the box. With sealed-cartridge bearings and steel spindles, these pedals are built to last. Even when hit with rocks, dirt, mud and everything in between, they won’t dent or bend. The aluminum platform helps keep the A530 pedals at a light weight of 0.22 pounds. Featuring a silver look, these are cool bike pedals, and they hide scuff marks well. Bonmixc Mountain 9/16” Bike Pedals – If you want pedals with a little more color and flair, Bonmixc’s mountain pedals may be the right choice for you. Available in blue, red and silver, these pedals look great on any bike. The dual-sided body is constructed with high-strength aluminum alloy, making these pedals lightweight and durable. These platform pedals have a 9/16” spindle with an excellent non-slip platform. Weighing just 0.45lbs, Bonmixc’s pedals have dimensions of 0.98” x 4.02” x 4.6.” And they’re compatible with a wide range of bike types, including old school, BMX, folding, mountain, track, road, unicycle, urban and more. If you’re looking for flat pedals with a nice grippy surface, Bonmixc’s pedals are a great choice. Imrider Cycling 9/16” Pedals – Imrider’s cycling pedals are sleek in design and come in three colors: black, red, and blue. 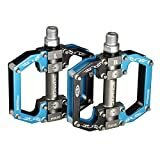 Ideal for mountain BMX and road bikes, these pedals have a flat platform and an antiskid nail surface. Lightweight aluminum alloys keep these pedals light, and the Cr-Mo, 9/16” spindle ensures durability. These pedals have dimensions of 115mm x 95mm x 23mm, and weigh just 0.87 pounds. The antiskid nails provide an extra-grippy surface, so your feet never slip – even in wet weather. And the design of these pedals makes them compatible with a wide range of bikes, including BMX, mountain, road, urban, track and even unicycle. If you want pedals that look great and offer a great performance, Imrider’s cycling pedals are a smart choice. Even after reading through our reviews, you may have a hard time narrowing your choices down to just one set of pedals. We know how difficult this decision can be, especially when most pedals look the same and have a similar construction. Material: Quality and material go hand-in-hand. But material also affects the weight and durability of the pedals. Most, but not all, are made from high-strength aluminum, which is lightweight and highly durable. Some pedals are made of plastic, which can also be durable, but don’t often last as long as their metal counterparts. Price: Cost is an obvious consideration when buying pedals. Some high-end pedals can be in the $40+ range, but are worth the cost – especially for serious cyclists. But you can also find a great set of pedals in a lower price range. Determine how much you can realistically spend, and find a set that matches the quality and features you want. Color: The look of the pedals won’t affect performance, but you may want a set that adds a little color to your bike. Numerous colors are available, from blue to white, but some show scuff marks more than others. Keep this in mind when choosing a color, especially if you like to keep a clean bike. Compatibility: Some pedals are designed specifically for certain types of bikes, while others are more universal in nature. Check the product description to make sure the pedals you’re considering are compatible with your bike.